Powered by AI and machine learning, intelligent apps can positively affect workflows and increase productivity at your organisation. Although challenges to enterprise app mobilization and modernization remain - in particularly time, cost and lack of skilled resources - there have been significant achievements in both processes and outcomes. Enterprise mobile apps are no longer device or OS specific and user experience is of the upmost in importance. Overall, adoption and retention rates are trending in the right direction. But getting to this point has taken a long time, and the consumer app market has already moved on. 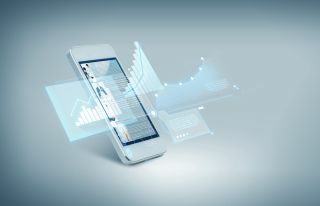 As enterprises continue to transform their legacy apps for the modern digital era, they are still trying to keep pace with the rapid innovation of the consumer app market. From voice dictation and chat bots to Google Home and Amazon Alexa, ‘smart’ devices and apps are now part of our daily lives - for better or worse. Simply providing mobile enabled access to key applications and data sources is not enough to satisfy the digital natives that are inherently mobile first or mobile only. While mobile access is important, the workforce - 75 percent of which will be millennials by 2020. Thus, the demand for consumer-like and intelligent experiences that they’re accustomed to in their personal lives will skyrocket even further. For the enterprise, apps that can deliver personalized and context aware notifications have the ability to significantly streamline the most important information that workers’ need, when and where they need it. For example, a salespersons’ workflow - when going to meet with a customer - entails pulling up their CRM record, finding the address and navigating to the location. However, instead of thumbing through multiple steps to access the intended data, a context aware app is already aware of the salespersons activity. Based on their calendar and traffic route, the app can surface the relevant data via a notification that allows the user to click and go, streamlining their process and increasing efficiencies. Bots help automate complex problems and can pull information in short order through natural language processing. Significant gains in productivity, increased response time, improved data accuracy and decision making are all real outcomes of chatbot adoption. Such practical advantages led Gartner to predict that by 2019, 40 percent of enterprises will actively use chatbots to facilitate business processes using natural-language interactions. When workers are at their desks, they have access to any number of programs and applications that allow them to complete all sorts of tasks. But remote workers - now almost 50 percent of the entire workforce and growing - don’t require such vast amounts of applications at their disposal. Instead, they need only what’s essential to completing the current job at hand.